"The Castle Beneath the Sea! Kuzumo and Dramidoro!!" 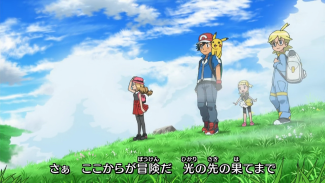 was an episode of Pocket Monsters XY that was originally scheduled to air on April 24th, 2014 but ended up being postponed until November 20th, 2014 instead. This page looks at the events leading up to the episode's original planned airing, what happened to cause it to be pulled from the schedule, and the journey that eventually led it to being aired seven months later. 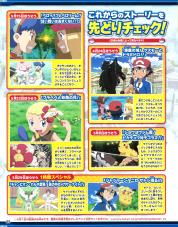 The May 2014 issue of Telebi-kun announces that the episode that is scheduled to air on April 24th, 2014 is going to be titled "The Castle Beneath the Sea! Kuzumo and Dramidoro!!" (海底の城！クズモーとドラミドロ！！). No summary or any other sort of details about the episode were announced. We get our first full summary of the episode a little over a week later. 4/24 #24 "The Castle Beneath the Sea! Kuzumo and Dramidoro!!" The Korean ferry the MV Sewol sinks en route from Jeju to Incheon on the morning of April 16th, 2014. The tragedy is believed to have been caused by a sharp right turn that shifted cargo to the left and caused the ship to experience an incline that allowed it to take on water. Overweight cargo is also being cited as a cause of the accident. Of the 476 passengers onboard, most of them students from Danwon High School, approximately 264 people died. 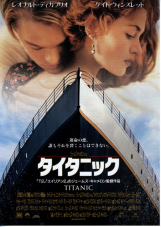 The ship was originally built by the Japanese company Hayashikane Shipbuilding & Engineering Co. Ltd in 1994. It was bought by the South Korean Cheonghaejin Marine Company, Incheon in 2012. After the accident the Japan Coast Guard offered assistance in the continuing rescue efforts but was their offer was declined. 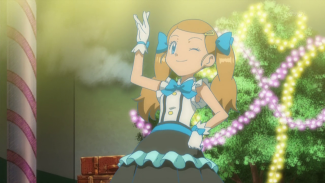 The 23rd episode of Pocket Monsters XY, "The Aurora Bonds! Amars and Amarruga! !," airs on TV-Tokyo. 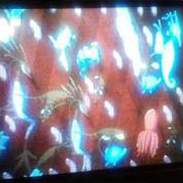 After the episode finishes, a preview for XY 024 airs. Click here to see a gallery of screenshots taken from the preview. Satoshi's narration during the preview tells us that the scientists' names are Eddie (エディ) and Lindy (リンディー), information we didn't have before. The tragedy had occurred the day before but it seems like the decision to not air the Kuzumo and Dramidoro episode hadn't been made yet. 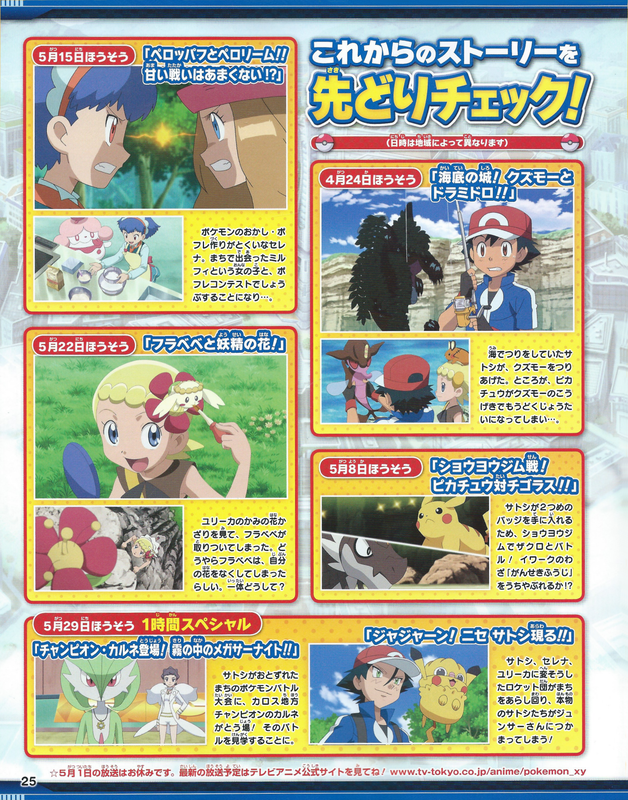 The 35th issue of the magazine Pokemon Fan featured a page detailing upcoming episodes of the TV series. 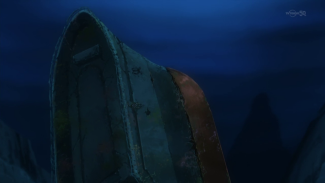 The first episode showcased on the page is "The Castle Beneath the Sea! Kuzumo and Dramidoro!!" This is the first we've heard of Pikachu getting poisoned in the episode. 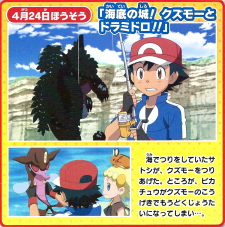 The episode of Pokemon Get ☆ TV that airs on the morning of April 20th shows a preview of "The Castle Beneath the Sea! Kuzumo and Dramidoro! !," indicating that the decision to postpone the episode still hadn't been made yet. 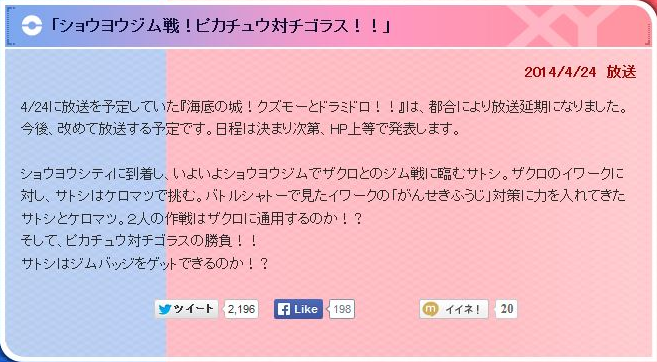 The very next day the TV-Tokyo website announces that the episode will be postponed. 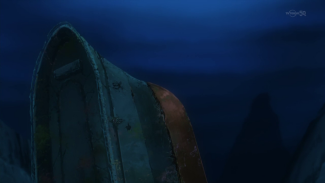 The episode that was scheduled to air on April 24th, "The Castle Beneath the Sea! Kuzumo and Dramidoro!! ", has been postponed for certain reasons. We are planning to air the episode again at some point. We will announce the the new schedule on this site as well as others as soon as it is decided. Notice the "for certain reasons" part; the website never specifically states that the sinking of the MV Sewol is the cause of the episode getting pulled. They also never came out and officially stated that the Great East Japan Earthquake was the reason the two-parter "The Rocket-Dan vs. The Plasma-Dan" either, for what that's worth. The text below this blurb is a summary of the following episode, "The Shouyou Gym Match! Pikachu vs. Chigaurus!!" The "Coming Soon" section of the TV-Tokyo site, which up until that point had the titles, airdates, and a picture of the next few episodes scheduled to air, was wiped clean. The same thing happened after the aforementioned Plasma-Dan episode. 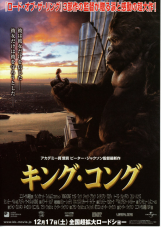 Meanwhile, the cable network WOWOW announced that an airing of the 1997 movie Titanic was going to be replaced with an airing of the 2005 movie King Kong instead. Reaction online to the news was not favorable, with many Japanese fans wondering why TV-Tokyo, a Japanese network, is altering its programming due to a Korean tragedy. Others stated that if they started postponing their programming due to foreign tragedies then there won't be anything left to air. 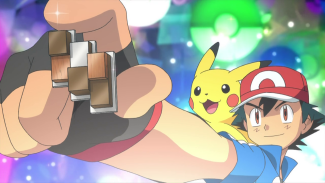 About tomorrow's episode of Pokemon...it seems as if the episode that was scheduled to air tomorrow has been postponed. Because of that, "The Shouyou Gym Match! Pikachu vs. Chigaurus" will be airing a week early. It's the rematch with Zakuro! @omodeakemi I think I already know the answer but won't the episode that got postponed have an effect on the progression of the show's story and create problems with its plot? Oh, whoops. Satoshi and Zakuro haven't battled yet so they're not having a rematch. Sorry about that. @nido_climax In a way, yes, it will cause problems with the plot...but it can't be helped. @omodeakemi @nido_climax When you say "In a way, yes, it will cause problems with the plot" are you talking about something like a hint as to how Satoshi came up with his counter-measure against Rock Tomb in tonight's episode? @acsctdfg @nido_climax Sorry, but I can't give out any details! But I think it'll be good if this episode ends up airing. She neither confirms nor denies what acs asks. What do you think the "problem(s) with the plot" (矛盾) will end up being? Yahoo! 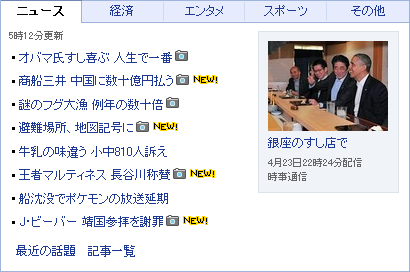 News, as well as a number of other Japanese news sites, report that the Kuzumo and Dramidoro episode is being postponed. 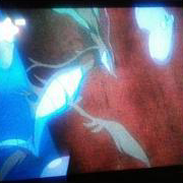 That night, the episode that would have been the 25th episode of Pocket Monsters XY, "The Shouyou Gym Match! Pikachu vs. Chigaurus! !," airs in place of the skipped Kuzumo one. No mention is made on-air of the fact that the episode that had been advertised the previous week wasn't airing. 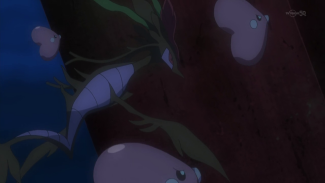 Now about Pocket Monsters XY, last week's episode was abruptly replaced with another one. This was done out of respect of those affected by the heartbreaking Korean maritime accident. We hope to be able to show the episode as soon as possible. 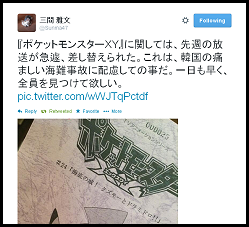 A photo of the front of the episode's script accompanied the tweet. This is the first time we've ever gotten any solid confirmation that the Korean ferry accident was the cause of the episode's postponement. Sure, we had all guessed that this was the case but it's nice to have someone associated with the show actually come out and say it. May 15th, 2014 - Easter Egg found in "Flabebe and the Fairy's Flower!" 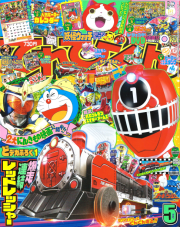 The date on the newspaper is 2014/5/15, the same date that the Flabebe episode aired on TV-Tokyo here in the real world. 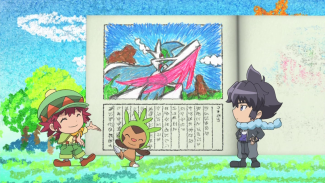 "Flabebe and the Fairy's Flower" was originally scheduled to air on May 22nd, 2014 but since the airdate got pushed up a week due to the Kuzumo episode being skipped over then it seems that the animators updated the text on this newspaper to match the new airdate. 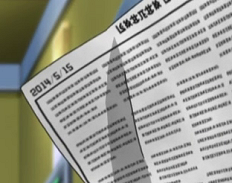 I imagine that the pre-Kuzumo version of this episode had the date of the newspaper as 2014/5/22. 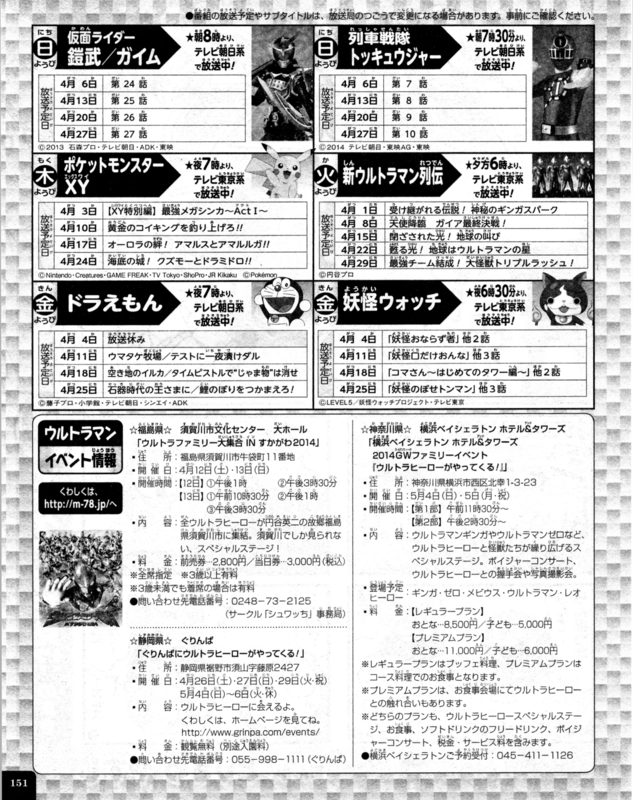 I've tried using the handy Anime Language guide over at Pocketmonsters.net to see if the newspaper's text has anything else of interest in there but the text, when decoded, seems to just be random gibberish. A simple text edit like this would have been extremely easy for OLM to do but it's still interesting to see them go to the trouble of adjusting this little detail. And really, it's amazing someone actually remembered that this was even a thing in the first place. Can you imagine what it was like in the offices of OLM? 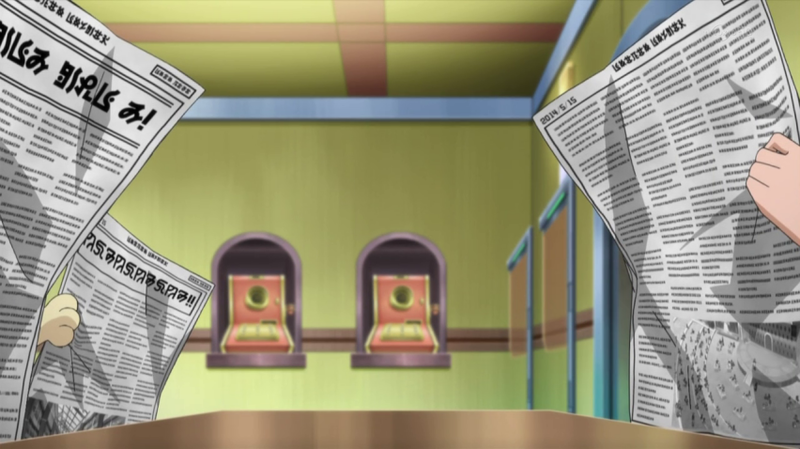 "Looks like we have to postpone the Kuzumo episode for a while and OMG THE DATE ON THAT NEWSPAPER IN THAT ONE SHOT IS WRONG NOW QUICK SOMEBODY FIX IT GO GO GO!!!!" May 20th - 21st, 2014 - "Undersea Place to Call Home!" Digging around on the Turner Broadcasting press site on May 20th, 2014 revealed that Cartoon Network had a listing for the episode "Undersea Place to Call Home!," indicating that TPCI had the skipped episode and was in the process of dubbing it. Undersea Place to Call Home!, A visit to the Muraille Coast sets our heroes on an aquatic adventure filled with undersea Pokemon! The episode had a tentative airdate of July 5th, 2014 at 8:00am. 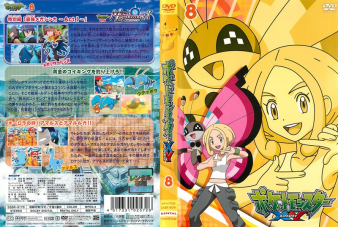 That date didn't really make sense given the number of Saturdays between the discovery of the title and the supposed airdate but a later announcement that the dub of the first Mega Evolution special would be airing on the extra weekend put everything back on track. The next day - May 21st, 2014, the episode's title was removed from the schedule and replaced with the next episode, "Climbing the Walls!" So what happened? 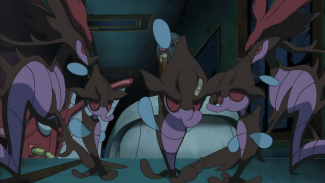 My guess is that TPCI got their hands on the episode and had been working on the dub long before Japan decided to skip over it and then sent the infomation about their version to Cartoon Network just like they always do. And then someone realized that, whoops, we're not actuallly allowed to air this just yet we'd better scramble to get this episode title taken down. A similar thing happened in Japan with the post-Best Wishes! Iris special, if you remember. 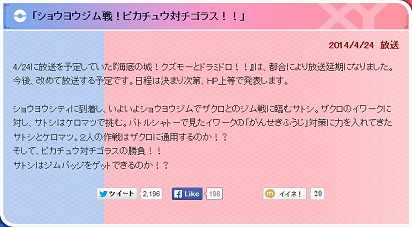 The episode's title "Iris vs. Ibuki! The Road to Being a Dragon Master!!" 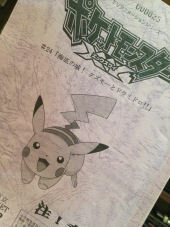 was revealed on the official Japanese Pokemon site back on October 6th, 2013 but then, two days later, the title had been quietly removed from the site. Just like with "Undersea Place to Call Home," it seems like information was revealed before it was supposed to be and was then quietly removed. Months pass and we don't end up hearing anything until about the Iris special until about a month before it aired on March 27th, 2014. August 8th, 2014 - The episode allegedly airs in South Korea...? 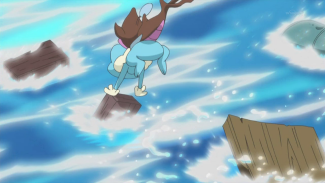 In the first week of August, reports came in that the skipped episode actually aired in South Korea. Which is weird for a number of reasons, but I'll get to that later. The Korean title of the episode is being reported as being 해저의 성을 지켜라! 수레기와 드래캄!!. 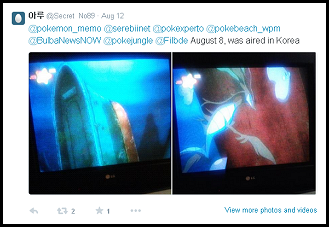 It allegedly aired on August 8th, 2014 at 6:30pm on an IPTV channel. 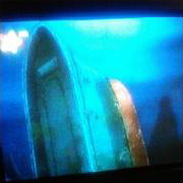 The previous episode (the Amars one) aired way back on April 29th, 2014, just a little under two weeks after the MV Sewol sank. 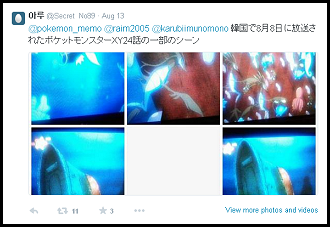 @pokemon_memo @raim2005 @karubiimunomono Scenes from Pocket Monsters XY 24, which aired in Korea on August 8th. Here's the problem I have with all of this, though; why didn't we have any detailed summaries, high quality screenshots, or video clips from the episode before the episode's Japanese airing? Why isn't 해저의 성을 지켜라! 수레기와 드래캄 up on any torrent site? Why should we trust some random guy on Twitter that none of us know? Why did we still only know as much about the episode on November 19th as we did back on August 7th? This all seems very suspicious to me. Right now the only "proof" we have that this actually episode aired in Korea are a couple of grainy photos taken by some random person on Twitter. It's going to take more than a "I heard it on the Internet so it must be true!" for me to believe that this actually aired. At the moment I'm going to think of this Korean airing as an unconfirmed rumor. 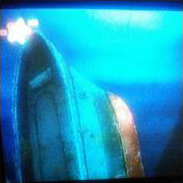 The episode "The Castle Beneath the Sea! Kuzumo and Dramidoro! !," which was postponed, will now air on November 20th. So! This episode finally has a new airdate! All that's left to do now is wait. On November 13th, 2014, "Dance Yancham! Dazzle Them Fokko! A Dance Step to Tomorrow!!" aired on TV-Tokyo. 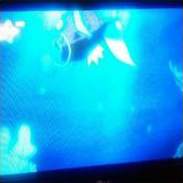 At the end of the episode a preview for "The Castle Beneath the Sea! Kuzumo and Dramidoro!!" was played. The preview is the exact same one aired back on April 17th. The reference made to the episode taking place on the Muraille Coast is kept, indicating that the episode may not have been retconned the way the Best Wishes! 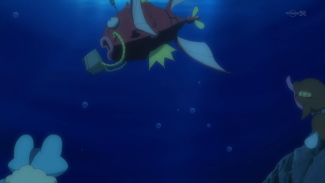 fishing episode was. The November 20th broadcast will be "The Castle Beneath the Sea! Kuzumo and Dramidoro! !," which was originally scheduled to air on April 24th. I'm a bit surprised that TV-Tokyo would be so open about the fact that this is an airing of an episode they had skipped earlier in the year. Being so open and up front about all of this seems a bit out-of-character for them, don't you think? On November 20th, 2014, nearly seven months after it was originally scheduled to air, "The Castle Beneath the Sea! Kuzumo and Dramidoro!!" finally premieres on TV-Tokyo. Unlike the Best Wishes! episode "The Fishing Sommelier Dent Enters!! 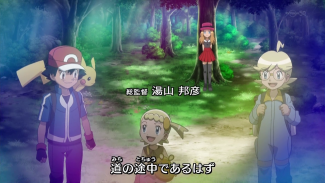 ", where numerous edits were made in order to make it seem as if the episode takes place later than originally intended, this episode of Pocket Monsters XY was shown as-is. 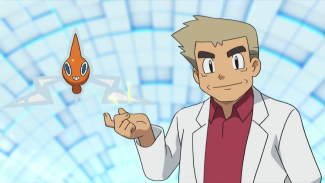 There were references to Satoshi having just left Koujin Town, his "upcoming battle with Zakuro" at the Shouyou Gym, and the fishing Koiking episode that would have aired about two weeks before. Satoshi's Hinoyakoma also goes back to being a Yayakoma for this episode. 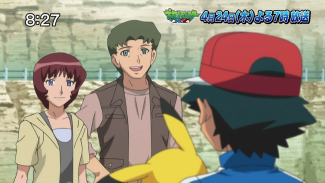 And remember how, back on April 23rd, screenplay writer for the series Omode Akemi (面出明美) hinted how this episode would provide Satoshi with a hint on how to win in the upcoming gym match? Well, I think we now know what she was talking about. I wonder if there was originally a flashback to this scene in "The Shouyou Gym Match! Pikachu vs. Chigoras!!" that got cut...? This episode also totally has footage of a ship crashing and sinking into the ocean, making it pretty obvious why it was postponed. 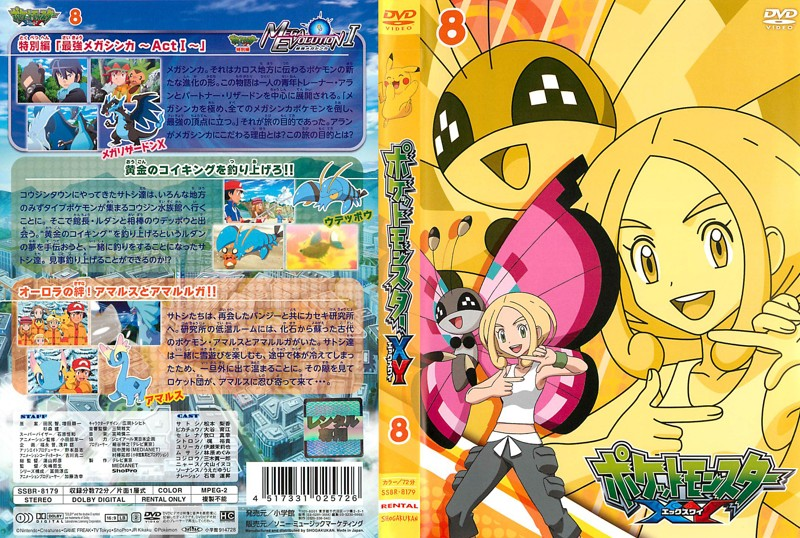 The Orchid-Hakase segment was also replaced with "Manon's Mega Evolution Illustrated Diary." I doubt the missing Orchid-Hakase segment will ever see the light of day. Other than that, the episode appears to have been untouched. And, just like that, this episode's crazy seven month journey comes to a close. November 20th, 2014 - Korean airing confirmed? The episode's TV-Tokyo's airing also helps prove that the purported Korean TV airing back in August did indeed take place. Here are the pictures that Secret_089 posted on Twitter back in August, put up against much higher quality screenshots taken from the Japanese airing. As you can see, they all match up. All of these shots occur after the Rocket-Dan remove the treasure vault from the ship about seventeen minutes into the episode. So I guess it apparently aired after all? 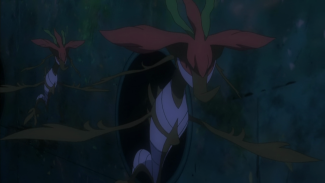 There are still way, way too many things that just don't add up about all this - the lack of any other screenshots or summaries after the airing; the fact that, as of this writing, the episode still isn't listed on the official Korean Pokemon site; the lack of any torrents of the Korean dub; the very premise that it would air in Korea before Japan and would do so on a TV network that doesn't even air Pokemon in the first place - but these screenshots are hard to ignore. 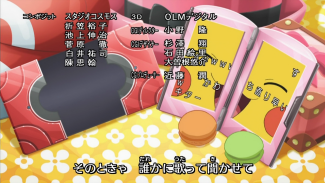 See the Lovecus at the bottom left-hand corner of the screen, the one right under Dramidoro? In the shot posted by Secret_089 its head looks kind of like a crab claw the way the right side is cut off. And yet no matter how much I tried I could not find a spot in the Japanese broadcast that matches that. Why does this happen? Did the Korean dub have some unfinished animation in it for some reason that got fixed for the Japanese broadcast? 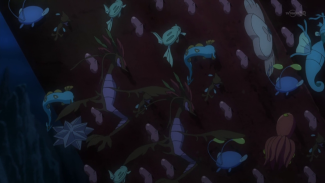 The lack of any sort of edits to retcon this episode into a later part of the series leads many fans to conclude that this episode should keep its original episode number of XY 024. 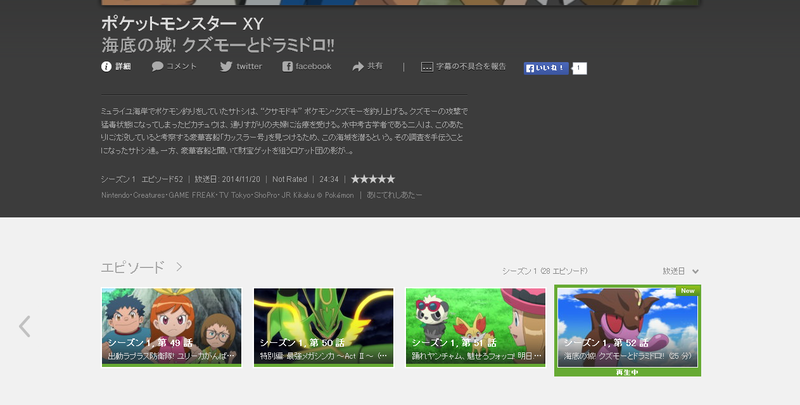 I would, however, like to point out that the Japanese Hulu site lists this as Episode 52. 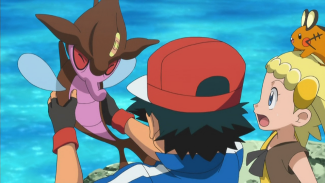 It also lists the two Mega Evolution specials as regular episodes ("Mega Evolution I" is Episode 22 while "Mega Evolution II" is Episode 50), for what that's worth. Click on the image below for a larger version. The rental DVDs in Japan also follow this numbering convention. 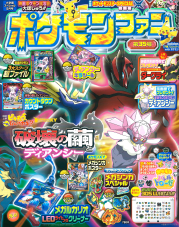 Volume 8, for example, is advertised as having Episodes 22 - 24, but if you look on the back you'll see that they're counting the first Mega Evolution special as Episode 22. So despite what might make sense to you and me, "The Castle Beneath the Sea! Kuzumo and Dramidoro!!" 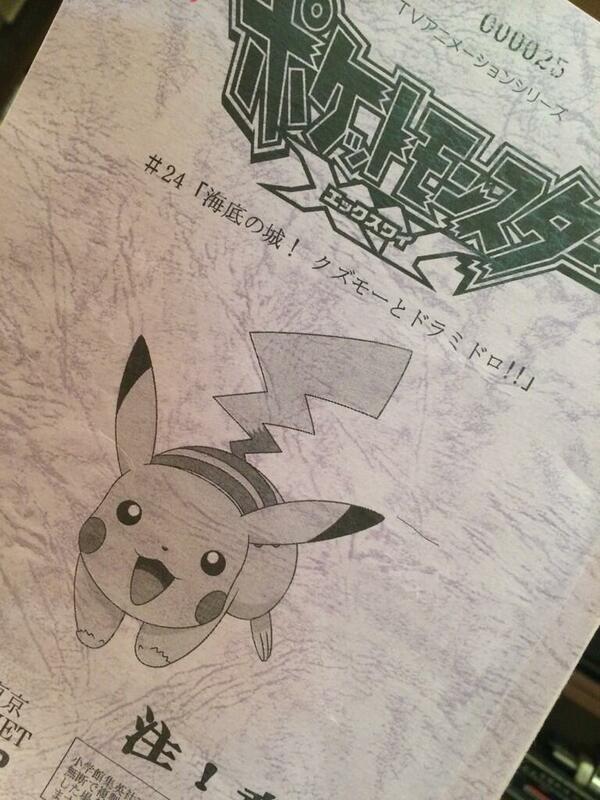 seems like it's going to be listed as the 52nd episode and not the 24th episode, officially. Of course if any information surfaces that changes that then I'll be sure to update this page accordingly.